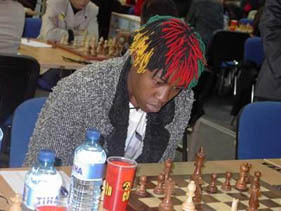 Linda Nangwale, 21, has been visible in Zambia for her chess accomplishments, and was part of the Olympiad contingent that traveled to Bled, Slovenia. In a interesting interview with America's WIM Jennifer Shahade, she reflects on her role in Zambian chess, her inspirations, her Olympiad experience and even some interesting views on why women have lagged behind in the chess arena. While Nangwale is a serious student of chess, she expressed her colorful personality (in a literal sense) through her hair style which was done in honor of the Zambian flag. Nangwale will continue teaching before pursuing university studies abroad. Reproduced with written permission from WIM Jennifer Shahade. This interview also appeared in the March 2003 issue of Chess Life. JS: Tell us a little about the chess scene in Zambia. NANGWALE: IM Amon Simutowe has been a great source of inspiration for chess in Zambia. He is very famous in Zambia, and his results are always in the newspapers. In the capital of Zambia, Lusaka, there are two million people, most of whom know who Simutowe is. JS: What is women's chess in Zambia like? NANGWALE: There are not a lot of women playing chess in Zambia, and my play has aroused a lot of interest. They announced some of my successes, and there were many men coming to my house to see if a woman could actually beat them in chess. Some days there were five or six men who came to play me in one day. JS: Do you ever get pressure from friends or family to live differently? NANGWALE: Yes. I am 21 now, which is a normal age to get married in Zambia. If you are not at least in a serious relationship by this age, people will start asking, "What are you doing, girl?" JS: What are your goals? NANGWALE: My short term goal is to become the first Zambian woman IM. Long term, I want to become a strong player among men. Outside of chess, I intend to go to a university. The fee that I am receiving to play there in Bled I am using to save up to pay for school. A lot of women would not be able to lay their hands on money without spending it on clothes. Here I tried an experiment by only bringing three pairs of trousers. I think the emphasis on clothes in women is related to an inferiority complex, where what is inside is not enough. In chess, you cannot afford to have an inferiority complex. This obsession with clothes, and the underlying inferiority complex is one reason that women still lag behind men in chess. JS: But you seem to have a highly individualized style. Your hair has attracted a lot of attention. NANGWALE: Yes, it is true. Before the tournament, I had my hair braided in the colors of the Zambian flag. I have been asked to give a number of interviews on TV and for magazine as a result of this hair. Even famous chessplayers compliment it. For instance, Nigel Short came up to me and said that I had great hair. JS: Do you teach chess in Zambia? NANGWALE: Yes, I teach to young girls in Zambian schools. I overheard one of them saying that I was her role model, and that really moved me. I want to study in another country, but before leaving Zambia I need to do more for those girls. JS. How has your time in Slovenia been? NANGWALE: Great! People are very friendly here. One man that I met on the boats across the lake showed me the whole country. He is someone who made me realize that life is not just about romantic relationships, but also pure friendships. If all the people in Slovenia are life this man, I might just move here. JS: Who is your favorite player? NANGWALE: Judit Polgar. It's really exciting to be playing here in the same event as she. I thought Judit Polgar was great before I knew she was a woman. I saw some games in Zambia -- J. Polgar vs. V. Anand -- and I was speaking about this great game, and somebody told me that J. Polgar was a woman, and I was so excited. Now I have positions from this game on my bedrooms wall. In this game she reduced Anand, who is another one of my favorite players, to a mashed potato. I like Anand because he proves that a person from a third-world country can be a great chessplayer. Both Anand and Polgar play 1.e4, and their aggressive style have influenced me. JS: Do you have a boyfriend? NANGWALE: Right now to pursue the goals that I have I cannot have a boyfriend. I don't think there is a boy who will understand that I would prefer to study the Sicilian variation or play in a blitz tournament than to spend time with him. Zambian Women's Olympiad Team: (from left to right) Elizabeth Mutale (Bd. 1), Linda Nangwale (Bd. 2), Felix Malata (captain), Mumba Chilufya (Bd. 3), Jita Kafumbwe (Bd. 4).